Staying flexible is important for the health and longevity of many things. Keeping a limber body will prevent stiffness and atrophy as age inevitably sets in. This is not unlike the aging process of a business. It's very easy to get comfortable in a pattern and eventually get so stuck in those ways that deviation from the norm seems impossible. For a very select few, this manner of business is not so injurious, but for others it means certain demise. This flexibility or fluidity is imperative for survival. There are so many changes that could interfere with production or supply in the blink of an eye. This is never more true than for companies in the beverage supply chain. Consumer desires are mercurial and their patience often runs thin, so it's crucial for beverage companies to keep up with the ever-changing demand. The business of wine, ales and spirits has changed greatly in the past century. Wines and beers were traditional imported and spirits were concocted in old distilleries or barns, so their flavors were just that of the alcohol itself. Fast forward to 2015 when Diageo, premium drink maker, produces hundreds of kinds of alcohols ranging from flavored vodkas to top-of-the-line rum worth $250,000, reported IndustryWeek. The source indicated that the company not only produces spirits, but is also high-spirited itself. Always seeking out that competitive edge, Diageo is constantly trying out new flavor combinations for its products. The innovations taken add up to about one per day, seeing which ones will catch on in alcohol-imbibing communities and which were simply valiant efforts, albeit strange. In order to accommodate these quick changes, Diageo's factories and suppliers need to have a quick turnaround times. One flavor doesn't take off? Cease production, sell off the remaining supply and work on the next project. This extreme fluidity is practically unheard of in the supply chain, but it does speak to the determination of the team to provide the public with new products as quickly as possible. It's been in the news recently that large chain restaurants such as Chipotle and Panera have made efforts to rid their dishes of GMOs and other unnatural additives, reported National Public Radio. These restaurants have worked closely with their suppliers to eradicate genetically modified corn and bleach from their kitchens, but have not made any changes to their soft drinks. The sodas available in these establishments still contain artificial sweeteners such as aspartame, which has been known to lead to certain health issues. 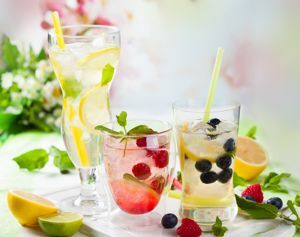 Though a Panera representative asserted that the company is working with its beverage suppliers to take care of these issues, the business has not made any changes yet, the source indicated. If the public calls for more natural options and national chain restaurants are taking notice, shouldn't other large companies follow suit? It's fascinating to see how these enterprises will tout natural flavors such as vanilla but stick with sweeteners that are anything but sweet. Perhaps it's time that soft drinks follow in the footsteps of hard alcohol producers and pay attention to consumer trends and wants. The supply chain can be a tricky beast to manage, but it can be handled with more ease if all parties are open to change. In business, nothing stays still for long and beverage companies, as well as others, should do well to go with the flow - or end up high and dry. Before approval as a food additive, sweeteners must undergo rigorous review and safety testing. Hundreds of studies have demonstrated the safety of aspartame and as a result all major regulatory agencies agree that there is no concern about the safety of aspartame use in food products. Aspartame is made from three simple building blocks that are commonly found in many other foods. After consumption, it is quickly broken down into these building blocks and they undergo metabolism under their normal pathways. For example, these building blocks can be found in protein- containing foods as well as fruit and vegetable juices.